KGinfo.ru was presented in Moscow as a web site for labor immigrants from Kyrgyzstan. Authors of the project believe that information posted on the web site will make adaptation in Russia easier. KGinfo.ru is presented as a web site of the Kyrgyz diaspora in Russia. It was announced at the presentation, however, that Kyrgyz diaspora in Russia was fairly fragmented and mostly consisted of several cultural associations that couldn't even boast of active interaction among themselves. Web site editor Asilbek Egemberdiyev suggested in connection with it that consolidation of the diaspora would be facilitated by existence of a web site where information could be exchanged and shared. There is nothing new about the idea. Vladimir Lenin, leader of the world proletariat, once wondered what was the first step to be taken and decided that it was necessary to start with a newspaper - a mass propagandist, agitator, and organizer. Lenin succeeded in his time. Banner "Lawyer's Advice" leads to six absolutely identical articles titled in Russian "Avoiding Unnecessary Redtape". Their content, however, is a computer-generated senseless compilation of Latin letters. Its origin is clear. When the web site was designed, it was inserted instead of actual texts. Why it was not removed for the presentation, however, is anybody's guess. Authors of the web site must have plain forgotten to do so. In a word, KGinfo.ru authors have a great deal to do yet. Anyway, this is the first web site that promises all information Gastarbeiters might find necessary. The idea is brilliant. It will make life considerably easier for the people who plan to seek employment in Russia and spare them the necessity to question relatives and acquaintances or surf the Internet in search of the necessary information. A web site such as this is really a must. People going to Russia must know what awaits them and how to deal with it. It will be great if web site authors found themselves in a position where they could offer legal aid to labor immigrants instead of referring them to lawyers of the Kyrgyz Embassy. It will be nice as well to see on the web site addresses and phones of Russian language schools for immigrants to take their children to. It will be nice to have the web site provide information on hospitals so that labor immigrants will know which hospitals to apply to for medical assistance. In a word, it will be nice to see the web site truly helpful instead of just being another journalistic and expert project restricted to studies of immigration (even that is possible, of course). Also importantly, a web site such as this is needed to enable labor immigrants themselves to air their problems. KGinfo.ru has a banner "Letters from Visitors". Save for a piece from Novaya Gazeta, it only includes a single letter for the time being. "Hi there! We work for a company in central Moscow - without days off and without pay on weekends. They tells us that we are not entitled to any and therefore force us to sweep streets and do whatever else crops up. We do not even know how much they pay us because the director himself parcels out cash - if any. There was no snow in December and January last year, but February was snowy and clearing all that snow was our responsibility. Needless to say, we were paid nothing for it. We heard in the meantime that the director was pocketing most of the money. All our questions are replied to in a simple manner: you are free to go any moment, they say. Treated like slaves, we are denied elementary conveniences. Endlessly humiliated, we cannot even respond because we have no rights whatsoever. That is why we cannot sign this appeal, for fear of being sacked." Will Russia hear the complaint? Let us hope. Recognition of the problem is the first step to solution. Contacts with labor immigrants as the target group is one of the main problems of the web site organizers. 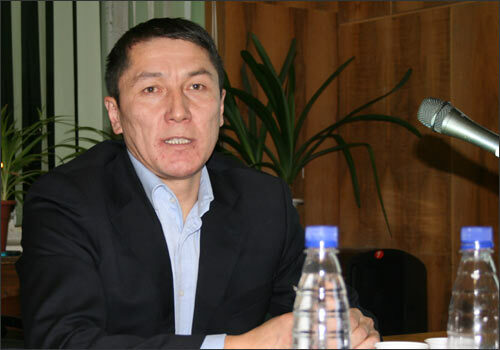 According to Egemberdiyev, Kyrgyz media outlets promised help with promotion of the web site. This correspondent was repeatedly told at the presentation ceremony that families of the Gastarbeiters working in Russia will be able to communicate with "their" relatives via the web site from "any Internet-cafe in Kyrgyzstan." It was also promised that the diaspora would make use of the web site too, to convey relevant information to immigrants. That Gastarbeiters themselves would be able to access the web site from Internet-cafes or from their cell phones... As a matter of fact, information may be printed and handed over in the form of flyers together with immigration cards right aboard the planes bound for Russia. Authors of the web site have a lot of room for improvement here. Web site editor firmly promised exclusive interviews and exclusive information on KGinfo.ru.